UTech, Jamaica Launches Global Entrepreneurship Monitor (GEM) Jamaica 2016 Report — UTech, Ja. 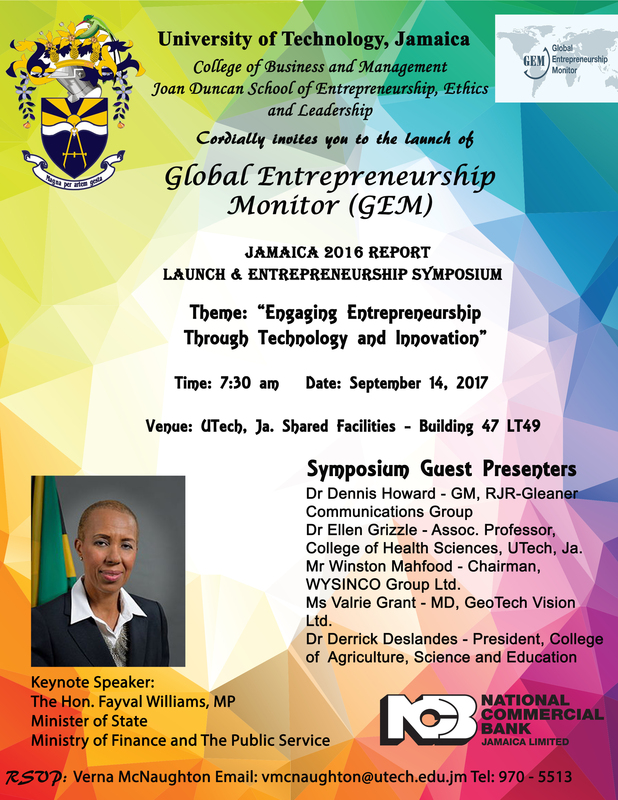 The University of Technology, Jamaica (UTech, Jamaica) through its College of Business and Management, Joan Duncan School of Entrepreneurship, Ethics and Leadership (JDSEEL) will on Thursday, September 14, 2017 launch the Global Entrepreneurship Monitor (GEM) Jamaica 2016 Report. The launch ceremony to be followed by an Entrepreneurship Symposium will be held at Lecture Theatre 50, Shared Facilities Complex, Papine campus commencing at 8:30 am. The Global Entrepreneurship Monitor (GEM) is the largest study of entrepreneurship in the world. Through a consortium of universities in 100 countries, GEM data is derived from an Adult Population Survey (APS) which tracks the entrepreneurial attitudes, activities and motivation of entrepreneurs in the participating countries and a National Experts Survey (NES) which monitors entrepreneurial framework conditions in each country which promote or hinder the growth of entrepreneurship, such as financial support, government policies, commercial and service infrastructure and physical infrastructure. Some of the key findings of the GEM Jamaica 2016 Report are that slightly more females (50.6%) than males (49.4%) are involved in entrepreneurship; Jamaicans are driven to engage in entrepreneurship by opportunities that exist and do not fear failure and small, easy to start-up businesses dominate the entrepreneurial landscape in Jamaica. However, while the possibility of operating a business is perceived positively, Jamaicans generally feel more comfortable having a job compared to being self-employed. UTech, Jamaica has led the research programme for Jamaica since 2005. Hon. Fayval Williams, MP, Minister of State, Ministry of Finance and the Public Service will deliver the keynote address at the opening ceremony. Prof. Paul Golding, Dean, College of Business and Management (COBAM) will officially launch the GEM Jamaica 2016 Report. UTech, Jamaica researchers led by Team Lead Researcher, Dr. Girjanauth Boodraj, Associate Professor, COBAM and other University researchers will present various aspects of the findings of the GEM Jamaica 2016 Report, including the characteristics of entrepreneurs; societal values and self-perception regarding entrepreneurship; early stage entrepreneurial activity; employee activity, technology and market expansion and the entrepreneurship ecosystem. The other researchers are Mr. Michael Steele, Head, JDSEEL, Associate Professors, COBAM, Dr. Claudette Williams-Myers, Dr. Andrea Sutherland, Dr. Gaunette Sinclair-Maragh, Head, School of Hospitality and Tourism Management and Mrs. Vanetta Skeete, Senior Lecturer, COBAM. The Entrepreneurship Symposium will be moderated by Dr. Dennis Howard, General Manager Radio Services, RJR Gleaner Communications Group, while Mr. Martin Henry, Manager, Projects and Operations, School of Graduate Studies, Research and Entrepreneurship, UTech, Jamaica will moderate the presentation on research findings. The GEM Jamaica research project’s main sponsor is the National Commercial Bank (NCB) Ltd.